Q. How do I find historic newspaper articles? 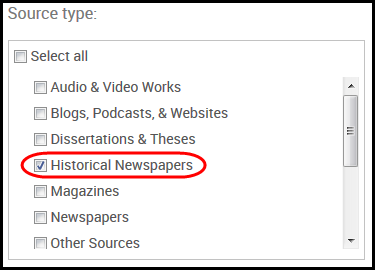 The easiest way for NOVA users to find historic newspaper articles is through the Proquest News & Newspapers database. Here are some guidelines on locating historic newspaper articles. 1. Go to www.nvcc.edu/library > Articles tab > “Databases A-Z.” Type "Proquest News" into the search box at the top of the page and click "Go." 2. Click the link titled "Proquest News & Newspapers" to access the database. If you are off-campus, you will be prompted to login with your MyNOVA username and password. 3. Click “Advanced Search," which is to the bottom right of the search box. This will allow you to select for full text results, specify a date range, and enter keywords.